Ebook $2.99 Download Ebook instantly! Enter a magical, surreal, mystical world - where anything is possible. Here is a collection of short stories, poems and other kinds of prose. 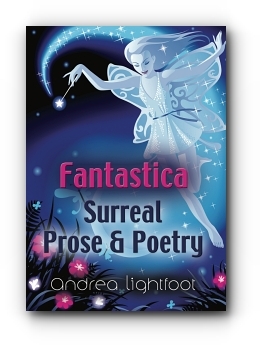 You will meet a whole host of characters - fairies, mermaids, deities, wizards and much more. You will also be witness to all manner of unusual, bizarre events. This book is designed to help you relax, unwind and let your imagination flow as you are taken on a journey through the realms of fantasy. Andrea Lightfoot was born in Liverpool and still lives near there with her family. She loves writing stories and poems. Her favourite books to read are in the fantasy and science fiction genre. She also enjoys drawing and doing other artwork. Andrea is also a member of a drama group.